Sowing and planting vegetable in Autumn will ensure produce can be harvested from next April in mild districts. Over wintered crops avoid the problems of insect and pest damage suffered by spring sown crops but beware of mice when planting seeds. Broad Beans can be sown in October or November. Most varieties should be hardy though I would select The Sutton which grows 2′ tall or Aquadulce Claudia. Peas of round seeded varieties such as Felthams First, Pilot or Douce Provence are suitable for autumn sowing. Mange-Tout should overwinter if you grow Oregon Sugar Pod. Garlic and Shallots are best planted in November. Carrots of the Nantes type such as Adelaide or Nantucket will mature in June if overwintered. Winter greens can often be bought as young plants for putting out in your veg plot. Protection is the name of the game if you want to boost crop yields. In wet regions use cloches to protect seedlings. Sow some seed in modules in a cold greenhouse for planting out in March to get an early crop. Cover with fleece in really cold weather. Shelter for strong winds where practical. Plan to get all your crops started before December by which time the soil will be too cold for sowing or planting out. Good drainage will help so I use raised beds. Place crops to benefit from winter sunshine. 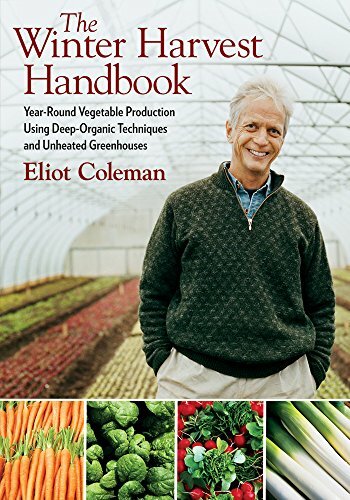 The Winter Harvest Handbook: Year-round Vegetable Production Using Deep-organic Techniques and Unheated Greenhouses. Eliot Colman helps the Home Farmer (and the keen gardener) extend their growing season to cover winter as his techniques can easily be adapted.